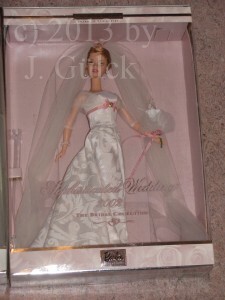 Before I gonna start this article I admit I love to collect Barbie doll brides. 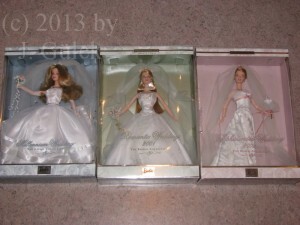 I don’t know how much brides I have in my collection at the moment but I have lots of brides. I think they look perfect. 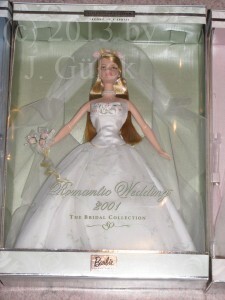 Every doll is unique but has its very own style. Today I gonna introduce a small but nice series called the Bridal Collection. This series contains three dolls. I think the series started in 2000 and ended in 2002. The one on the left was deboxed for several years but I had to put her in her box again when I moved three years ago. Somehow the she reminds me of Julia Roberts in “Runaway Bride”. 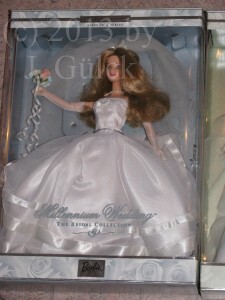 The dress is very similar and it’s very overhanging but you can’t see this when the doll was never removed from its box. The second one was the last one missing in my collection. I think I got her in 2008. The design is very interesting although I’m personally not the biggest fan of romantic wedding dresses but I think it’s suitable for Barbie. The third and last one somehow reminds me of the wedding dress that Queen Maxima from the Netherlands wore at her wedding. Maybe it’s because of the train? Anyway, I like the design of this dress too because it’s different from the others. I wish the series would have contained more than 3 dolls. I know I haven’t posted anything in the last 2,5 month. I have been very busy. Now that I have time again I would like to show you my little Ski Fun collection. I got the Barbie and the horse in 1991. Unfortunately most of the barettes got lost and I had to search and search and search to get new ones. I was so happy when I got them back. In summer I also found the dog Snowball, that I always wanted but never found, and the blanket of the carriage. Maybe I can find the rest of the carriage in the future to complete my Ski Fun collection. It’s not the original saddlery that you can see. The original one was pink and I used the one that was delivered with the luxury horse trailer in 1996/1997. Hope you like the pics.